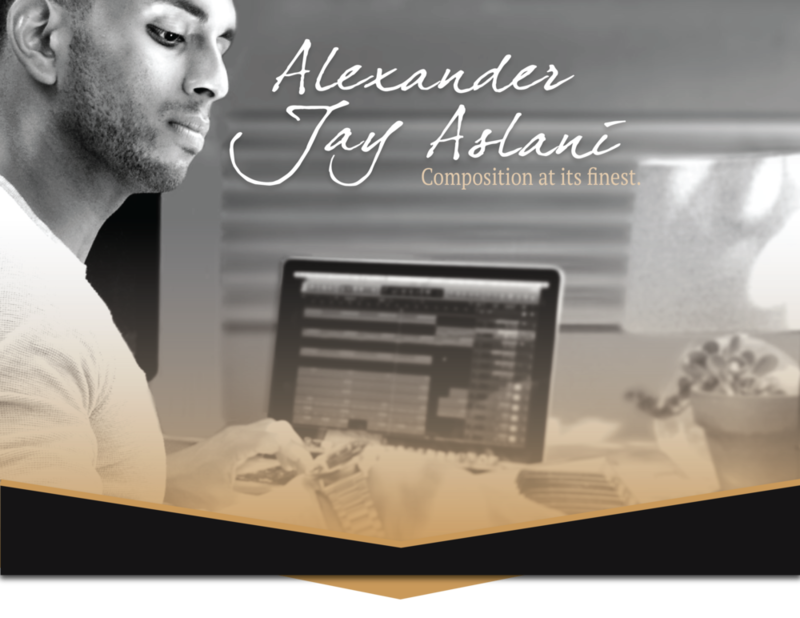 Alexander Jay Aslani is an up and coming composer from central Florida with a voracious thirst for new sounds. At the age of ten his Grandmother and parents willed him to be classically trained and introduced him to the piano. Later Aslani taught himself guitar and percussion. He now appreciates the classical knowledge he received, which has allowed him to evolve into the fundamentally sound musician he is today. Aslani admits to being influenced by his Middle Eastern background. His family introduced him to cultural music at a very young age, including Persian, Spanish, and Indian genres. His appreciation of unique cultural sounds is apparent in his work. Aslani often samples traditional foreign songs, and is interested in coloring existing modern tracks of different genres with ethnic sounds. Aslani is most interested in creating innovative, and ambitious scores. Although Alsani’s passion is rap, his newest endeavor includes composing film and video game scores. He attributes this recent discovery to his love for Nobuo Uematsu and the inspiring Donkey Kong Country Two score by David Wise. Aslani orchestrates emotion, and composes thoughtfully in hopes that his sounds will make you feel something. His tracks are fresh, suspenseful, experimental, and emotionally charged. “Setting boundaries musically just doesn’t feel right to me. I just hope to get the opportunity to touch people's lives with my musical work." Aslani aspires to work on film and video game scores, and he hopes to continue to write for many different artists. This is his life’s work, true passion, and his dream. Feel free to say hello, I'd love to hear about your project.